Abstract: Weeds cost the Australian economy $4 billion each year in lost agricultural production, management and control activities. Our natural ecosystems, flora and fauna are also adversely impacted, as is human and animal health. A significant time lag can exist between the initial naturalisation of a non-native species and its expansion to cause significant economic, environmental and social impacts. 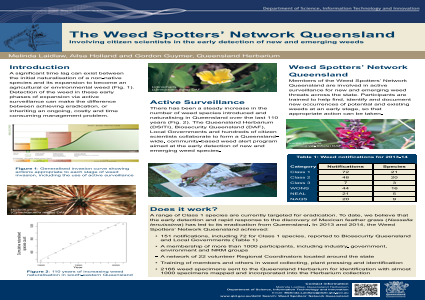 Detection of a new weed in the early phases of expansion via active surveillance can make the difference between achieving eradication or inheriting an ongoing, costly and time consuming management issue.